ABC NEWS' CHRIS VLASTO: And we have Keith Davidson -- he’s the lawyer for Stormy Daniels and Karen McDougal, both of the women who made headlines during the presidential campaign, as having a relationship with president trump, or then Mr. Trump. So, it should be an exciting show. PHILLIPS: But first, I want to bring in our senior editorial producer John Santucci, who has been covering the Trump family since the campaign. And, our first guest, David Bossie. Trump’s former deputy campaign manager. He’s also cohost of the podcast "Dave and Corey from Deep in the Swamp," he does that with former Trump campaign manager Corey Lewandowski. Now, Dave is the CEO of Citizens United, a conservative nonprofit organization known for winning the landmark 2010 case that allowed corporations and unions unlimited independent political ad spending. But back during the Clinton administration, he was a chief congressional investigator. Dave, thanks for being here. Let’s get right to it. VLASTO: So, Dave Bossie and I have known each other. This is now the third person we've heard on this podcast that I've known for at least 25 years. DAVID BOSSIE: That says you're old, I don't know. I don't know what else that says besides you got old on me. PHILLIPS: You have more gray hair though, Dave, than Vlasto. VLASTO: So yeah you're older. BOSSIE: I have a lot more stress. BOSSIE: I was the chief investigator, yeah. VLASTO: Which is the committee now that [Rep.] Elijah Cummings is now the chairman? VLASTO: So you were the guy going after a White House. VLASTO: Dave, Dave, Dave. They said that about you. ABC NEWS' JOHN SANTUCCI: Right. I was just going to say. BOSSIE: Of course they did. Well they never actually said that but they thought that. VLASTO: No, there were articles written about you. BOSSIE: Well, there were plenty articles written about me. They never. They never got that far. VLASTO: But, you know what I'm saying is that the Clinton White House called you exactly the same thing. BOSSIE: We were far from out of control, but we were - we were dedicated to our mission. And that is what I see happening today. On the Democrat side. And I think - I'm encouraging them to continue down this path because the American people are very smart. They rejected what we did in - 20 years ago and they will reject this 20 years later because the American people will see it for what it is. Their single focus on the Mueller report when it comes out whatever it is, we don't, none of us know when it will be and what it will say. But if it says there was no collusion, there was no cooperation no coordination. Which I know that that's what it's going to say because there wasn't any. Is that the American people will say OK where - what are we doing now to benefit America? How are we getting back to business? What are we doing to move on from it? And instead the Democrats, instead of having an agenda for the American people, will have an agenda for more investigations. VLASTO: The president's former lawyer said, called Bob Mueller an American hero and said this was not a witch hunt which got enormous play all around the country. But what do you think of Bob Mueller? BOSSIE: Look Bob Muller is - is somebody who has lived his life in the public arena. He is, whether he served in the military or you know with the Department of Justice, FBI. SANTUCCI: Is he an American hero? BOSSIE: I don't qualify. Many - look that's not. Those are not my words. I'm not going to play the word game with you on him. I believe that he from his report - I give - I really believe that we're going to see and I call for the report to be made public as much as humanly possible. We all understand the grand jury components right? The testimony and the evidence that are his grand jury. We won't be able to see that and maybe we will later. Just like with Starr operation -they had to go back and make that public after the fact. We will see. But I'm interested in the two sets of rules of Bob Mueller and the two sets of rules are one set of rules for anybody with the Trump operation and anybody else. Why were the decisions made by the FBI by people working for Mueller to not have a continuous investigation into Hillary, Huma Abedin? Because all of those things fell under his purview. SANTUCCI: Well, but hold on a second though they - they really didn't. The purpose of the special counsel was to investigate Russian collusion as it related to the Trump campaign. SANTUCCI: But you’re saying, you’re saying this report should include Huma Abedin and Hillary Clinton? That's not a part of what this investigation was. BOSSIE: Of course it, of course. BOSSIE: John, he had to look at what Comey did, he had to look at what the FBI did as it relates to the Russia investigation - was he dedicated just to adversely affect the president? SANTUCCI: I want to take you back up to Capitol Hill. Cause this is your area of expertise, so, you know many people were commenting after the testimony of Michael Cohen that the Republicans were not doing the best job possible? PHILLIPS: So what should they have done differently? BOSSIE: I would have attacked Michael Cohen's credibility a lot more than they did. They did a decent job at it, but I think they could have gone much harder. SANTUCCI: So how did the Republicans screw up that hearing? VLASTO: Sound bite kind of moment. BOSSIE: But it didn't. But it didn't help for the setting the stage for the day. OK? And in my opinion. So, those are the things that you don't want to see happen. But look the staff didn't. I don't think the staffing and the members - when you are running a committee like this you have to have the members in the seats for the hearing. If you looked around the room - there weren't many Republicans sitting in the seats. BOSSIE: That's a very dangerous thing if you're the ranking member because you don't have any cavalry to help you at all. SANTUCCI: So, then as the expert on this I mean have you offered your services to these committees? Have you gone up there and help them in any way? BOSSIE: You know I'm a guy who is happy to provide any type of advice and counsel and historical perspective if they ask. SANTUCCI: And have you provided? BOSSIE: You know. Well what I've tried to do - yes of course, I have talked to members of those committees including, you know, the leadership of both of those committees. SANTUCCI: So we’re talking about Judiciary and Oversight? BOSSIE: And Oversight. Yes sir. And so and I just think that you know they see the world in the right way. I think that this is moving very quickly. You're not going to be perfect on day one. And I think that what they learned, kind of in a good way - if you’re judiciary, without really much harm to anyone you learned what your strengths and what your weaknesses were and how to get better for the next time because on the heels of that now we see the 81 letters going out. If I'm one of those 81 people - if I'm one of those 81 entities I don't answer it. I don’t respond. PHILLIPS: So what did you tell them? What did you? BOSSIE: I would tell them never to respond. VLASTO: How about the White House? Is the White House ready for the - you know what the onslaught’s going to be, you know how all these subpoenas, and these battles? BOSSIE: I would I would say you're never ready enough. OK. I'm just a guy who wants to make sure that you control every aspect of everything. So you know what's coming. You see around corners. Do I see a killer team that is ready for the impeachment proceedings that are potentially coming? And I see that's where these Democrats are headed. We are headed to impeachment. So do I think the White House is ready? From a staff standpoint - I would say no. Today. Do I believe they are in the process of getting ready? Yes. VLASTO: Going back to our old history and the Clinton White House was very smart of having two separate groups. VLASTO: Mike McCurry dealt with the briefings and then they had a whole legal team with Lanny Davis. VLASTO: But that, it’s not a, it doesn't exist now though. I mean this could happen now. I mean impeachment. BOSSIE: No, no Chris. You're exactly right. VLASTO: Impeachment happens, very quickly. BOSSIE: We’re not ready. And you know, I don't know that I have the dates in front of me. But you know, it was basically early part of September, maybe September 9th that Ken Starr filed his report. It was about December 19th that the House voted on impeachment. BOSSIE: OK. So report to him, to actual impeachment was 10, 11 weeks. Then the trial started in January 9th or 10th. And the vote to acquit in the Senate was mid-February. So it was only about five week trial. So you have to be ready that this thing is not going to be a slow roll. OK? It has the potential - not to be a slow roll. Let me say that. PHILLIPS: So, is the president ready for that. What is his state of mind right now is it. PHILLIPS: Is it impacting his ability to lead this country? PHILLIPS: The Mueller probe, all these subpoenas. No it's not? He’s fine? PHILLIPS: It's not bothering him at all? PHILLIPS: As he's tweeting about? BOSSIE: All presidents, all presidents you know, not all presidents have had Twitter. OK? Because it didn't exist. OK? PHILLIPS: Well we get to see inside the president's head on a regular basis because of Twitter. BOSSIE: It would be pretty scary to have been inside President Clinton's head in the 90s if Twitter had existed. But every president whether they're going through Iran Contra, whether they're going through 9/11, and whether, whatever they're going through whether it's a crisis, whether it's a scandal, they're the president of the United States. They're taking care of their business and these things. You have a team around you that you need to be there to work on whatever that issue is of the day. PHILLIPS: How is this going to impact 2020? BOSSIE: Well you know I think I think the president has the potential to benefit from all of this. This is where I was headed, which was where we started, let's just close the circle with congressional overreach, with overzealous prosecutions with - the American people are very smart. They saw what happened to Bill Clinton and in the mirror image you can see this playing out again in its reverse. The Democrats are paying us back for what we did to Bill Clinton. There is a piece of that as part of their motivation here. We will see the American people respond to these investigations whether they believe that Congress is overzealous. If there is congressional overreach - the boomerang effect is the ability to help the president. That's where the Democrats have to play this very smart. VLASTO: But is that a distraction though. Do you think that that the president will have a hard time not paying attention to it? Right? BOSSIE: Look you have to pay attention. Nobody's saying that it's not going to be something that the president and his team will be focused on. It is simply that it's not going to dominate his mind. He's out there working every day. I've seen him over the last several years during the campaign and in this White House where he's able to compartmentalize - all presidents do that. That's what you're paid to do as president is focus on the big pictures and then get to the other things as needed. PHILLIPS: So, yes or no? Trump is going to be reelected? 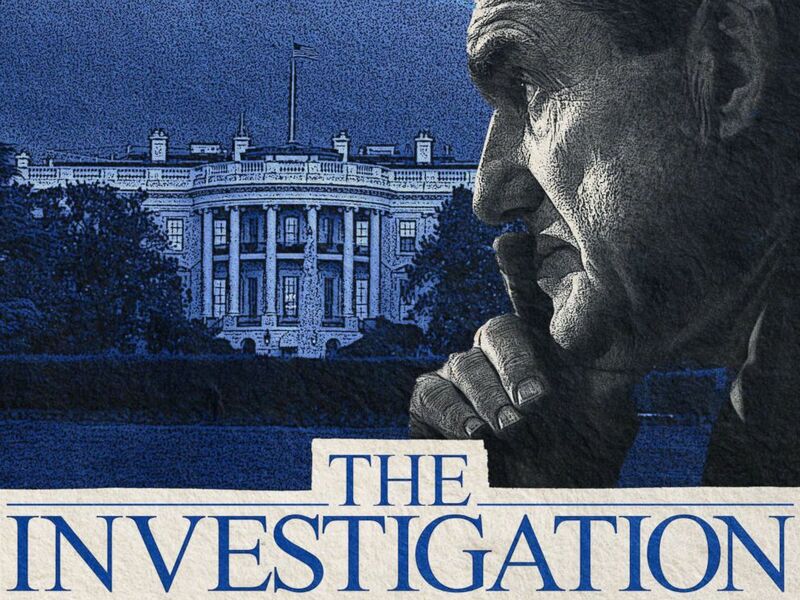 "The Investigation" is a podcast series offering an in-depth look at special counsel Robert Mueller’s investigation into Russian interference in the 2016 presidential election and its aftermath, analyzing the potential fallout and political consequences. Hosted by ABC News correspondent Kyra Phillips and the ABC News investigative team, led by Senior Executive Producer Chris Vlasto. "The Investigation" is available for free on Apple Podcasts (via iPhone), Google Podcasts (via Android), Spotify (via smartphone and desktop), Stitcher (via smartphone and desktop), TuneIn (via smartphone and desktop), the ABC News app (via your smartphone) or your favorite podcast player.